The Denver Nuggets opened their season with a hard-fought 107-98 win over the Los Angeles Clippers on Wednesday night at Staples Center. Big man Nikola Jokic led the way with 21 points while Gary Harris scored 20. Will Barton chipped in 19 and Paul Millsap Paul worked hard on both ends of the floor to finish with 11 points and a game-high-16 rebounds. 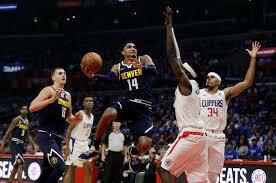 Denver aggressively attacked to basket and was rewarded with 42 free throw attempts against the Los Angeles' 24. It was a nip-and-tuck battle form the start with Denver holding just a slim 74-73 lead after three quarters. The Clippers, who hope to rebound against the OKC Thunder this Friday also at Staples Center, netted 19 points and 10 rebounds from Tobias Harris while Danilo Gallinari accounted for 16. Photo: Gary Harris weaves through traffic during Wednesday night at Staples Center. Click here to view a list of other articles written by Carlo Jay Cabagnot.